Keep building hallways safe and dry by offering your customers a complementary wet umbrella bag on our unique stanchion post. Place this stanchion stand in the lobby of the entrance way to provide customers with a plastic bag as they come in from the rain. The recyclable bag prevents water from being carried throughout the building to reduce the chance of slip and fall accidents. The stanchion stands come standard in two basic finishes, but can be built with a variety of base styles and finishes to match any decor. 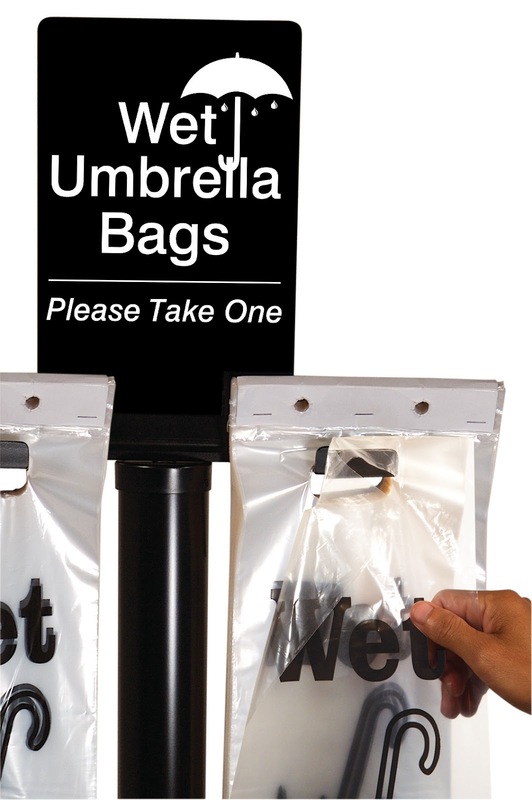 Use the Wet Umbrella Bag Dispenser and Stanchion Stand to help you increase the safety of your customers. Prevent water from being carried throughout your building. The Wet Umbrella Bag Stands are mare of solid aluminum & steel construction ensuring long term durability. Custom finishes and styles are available upon request. Select from a wide range of stanchions, classic rope and posts and barriers that are manufactured right here in the USA. Many retractable belt stanchion products today are imported from China. They are low cost and made of low quality metals, fabrics and parts. We take pride in offering quality stanchions and products that are manufactured by American craftsmen and women and manufactured right here in the USA. Here's wishing you and your family a Happy 4th of July Holiday!